AIP Precision Machining has worked with many thermoplastics over the past three decades, including TORLON: a PAI, or polyamide-imide, engineered by Solvay Specialty Polymers. Due to its reliable performance at severe levels of temperature and stress, TORLON is ideal for critical mechanical and structural components of jet engines, automotive transmissions, oil recovery, off-road vehicles and heavy-duty equipment. AIP has over 35 years of experience machining complex components from TORLON and various other thermoplastic materials. We are providing this Machining TORLON Guide as yet another insightful technical brief about our polymer component manufacturing process, and how it differs from that of metal machining, injection molding, or 3D printing. Before discussing the process of machining TORLON, it’s important to understand exactly what plastic machining is. CNC (Computer Numerical Control) machining is a process in the manufacturing sector that involves the use of computers to control machine tools. In the case of plastic machining, this involves the precise removal of layers from a plastic sheet, rod, tube or near net molded blank. The early history of CNC machining is almost as complex as a modern CNC system. The earliest version of computer numerical control (CNC) technology was developed shortly after World War II as a reliable, repeatable way to manufacture more accurate and complex parts for the aircraft industry. Numerical control—the precursor to CNC—was developed by John Parsons as a method of producing integrally stiffened aircraft skins. Parsons, while working at his father’s Traverse City, Michigan-based Parsons Corp., had previously collaborated on the development of a system for producing helicopter rotor blade templates. Using an IBM 602A multiplier to calculate airfoil coordinates, and inputting this data to a Swiss jig borer, it was possible to produce templates from data on punched cards. Parsons’ work lead to numerous Air Force research projects at the Massachusetts Institute of Technology (MIT) starting in 1949. Following extensive research and development, an experimental milling machine was constructed at MIT’s Servomechanisms Laboratory. Due to the many different kinds of polymers and composites, it’s important to have strong technical expertise of polymer materials when machining plastic components; some plastics are brittle, for example, while others cut similarly to metal. The challenge of plastics is their wide range of mechanical and thermal properties which result in varying behavior when machined. Therefore, it’s important to understand the polymer structure and properties of TORLON if you’re machining it. When it comes to polymers, you have two basic types: thermoplastics and thermosets. It’s crucial to know which one you’re working with due to distinct differences between how these two main polymer categories react to chemicals and temperature. Thermoplastics soften when heated and become more fluid as additional heat is applied. The curing process is completely reversible as no chemical bonding takes place. This characteristic allows thermoplastics to be remolded and recycled without negatively affecting the material’s physical properties. Thermosets plastics contain polymers that cross-link together during the curing process to form an irreversible chemical bond. The cross-linking process eliminates the risk of the product re-melting when heat is applied, making thermosets ideal for high-heat applications such as electronics and appliances. 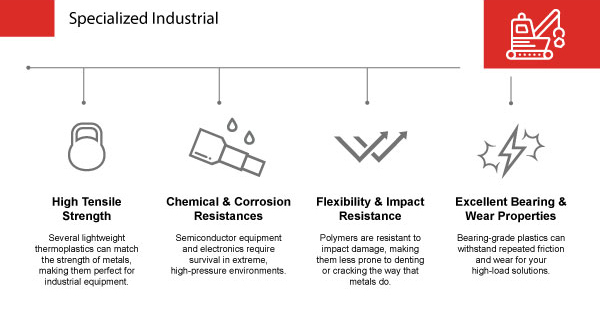 Phenolic, Bakelite, Vinyl Ester and Epoxy materials would be considered examples of a thermoset, while ULTEM, PEEK, DELRIN and Polycarbonate materials are examples of thermoplastics. TORLON is considered an amorphous, high-performance thermoplastic. Most amorphous polymers are thermoform capable, translucent and easily bonded with adhesives or solvents. 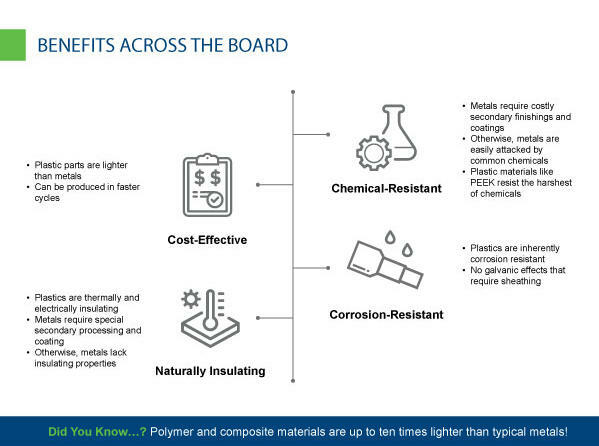 What makes TORLON unique is how it possesses both the incredible performance of thermoset polyimides and the melt-processing advantages of thermoplastics. The compressive strength of (unfilled) TORLON PAI is double that of PEEK and 30% higher than that of ULTEM PEI. In fact, TORLON is considered the highest performing, melt-processible plastic. 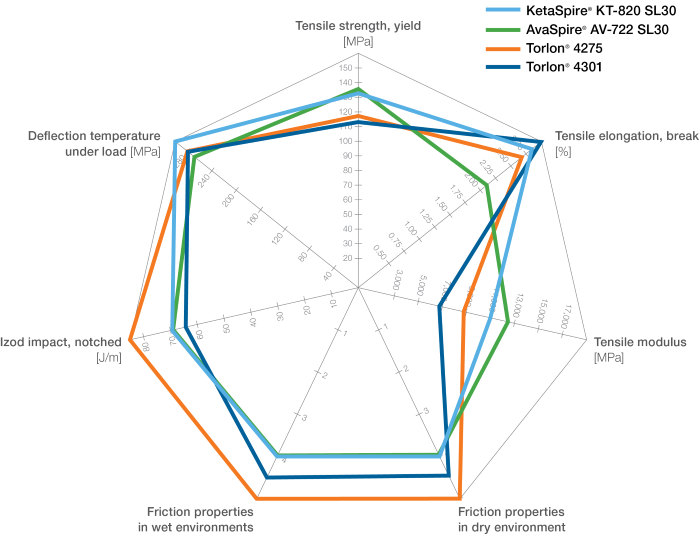 High-strength grades of TORLON retain their toughness, high strength and high stiffness up to 275°C. This and its impressive wear resistance allow TORLON to endure in hostile thermal, chemical and stress conditions considered too severe for other thermoplastics. TORLON is also resistant to automotive and aviation fluids, making it a favorite of aerospace and automotive engineers. One concern of using TORLON is that its moisture absorption rate is not as low as other high-performance plastics, so special care should be taken when designing components for wet environments. There’s more than one particular type of TORLON PAI you can machine, and each has slightly different properties for perfecting this material’s use in different applications. Here are several grades of TORLON PAI we machine regularly at AIP Precision Machining. TORLON 4203 is the unfilled or natural grade of TORLON PAI that outperforms other grades with the best impact resistance and the most elongation. TORLON 4203 PAI can be used for a variety of applications but due to its good electrical properties, it is commonly machined for electronic equipment manufacturing, valve seals, bearings and temperature test sockets. TORLON 4301 is a wear-resistant grade of TORLON PAI containing PTFE and graphite. It has high flexural and compressive strength with a low coefficient of friction, as well as good mechanical properties. Typical applications of 4301 are anything that requires strength at high temperature with wear resistance and low friction. This material is useful for parts such as thrust washers, spline liners, valve seats, bushings, bearings and wear rings. TORLON 4XG is a 30% glass-reinforced extruded grade of PAI well suited to higher load structural or electronic applications. When you need a high degree of dimensional control, this grade offers the high-performance you need. Various uses of TORLON 4XG include burn-in sockets, gears, valve plates, impellers, rotors, terminal strips and insulators, among others. 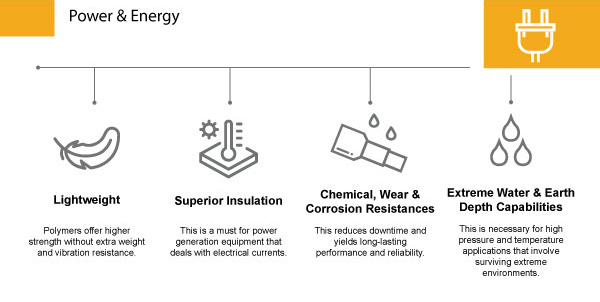 TORLON 4XCF is a 30% carbon-reinforced extruded grade of PAI that has the lowest coefficient of thermal expansion and the most impressive fatigue resistance of all plastic materials. This uncommon grade works well as a replacement for metal applications as well as mission-critical aerospace components, in addition to impellers, shrouds and pistons. TORLON PAI can be received in the form of rods, sheets, tube or film. Stress-relieving before machining through an annealing process is crucial, as it reduces the likelihood that surface cracks and internal stresses will occur from the heat generated. This also helps prevent any warping or distortion of your plastic materials. TORLON additionally benefits from post-machining annealing to reduce any stress that could contribute to premature failure. Extruded TORLON parts, such as those machined from TORLON 4XCF and TORLON 4XG, benefit from an additional cure after machining to further enhance wear resistance; this is unique to PAI. Proper annealing of Torlon can require more than seven days in special ovens at AIP. If the machine shop you are working with does not have a computer controlled annealing oven for plastics, then “head for dee hills” as they are obviously not TORLON machining experts. An important consideration to have when machining TORLON PAI is how abrasive it is on tooling. If you’re machining on a short run, carbide tooling can be used, but polycrystalline (PCD) tooling should be considered for lengthier runs, machining for tight tolerance and any time you are working with reinforced grades. Another thing to keep in mind when machining extruded TORLON shapes is that they have a cured outer skin, which is harder than interior sections. The outer skin offers the best wear and chemical resistance. If wear resistance and chemical resistance needs to be optimized, extruded TORLON should be re-cured. TORLON PAI will nearly always require the use of coolants due to its stiffness and hardness. Non-aromatic, water-soluble coolants are most suitable for ideal surface finishes and close tolerances. These include pressurized air and spray mists. Coolants have the additional benefit of extending tool life as well. Many metal shops use petroleum-based coolants, but these types of fluids attack TORLON. Many past experiences have shown parts going to customer without cracks, only to develop cracks over time due to exposure to metal machine shop fluids. Be sure to use a facility like AIP who machines polymers and only polymers. Contamination is a serious concern when machining polymer components for technically demanding industries such as aerospace and medical. To ensure the highest level of sanitation down to the sub-molecular level, AIP Precision Machining designs, heat-treats and machines only plastics, with any sub-manufactured metalwork processed outside our facility. 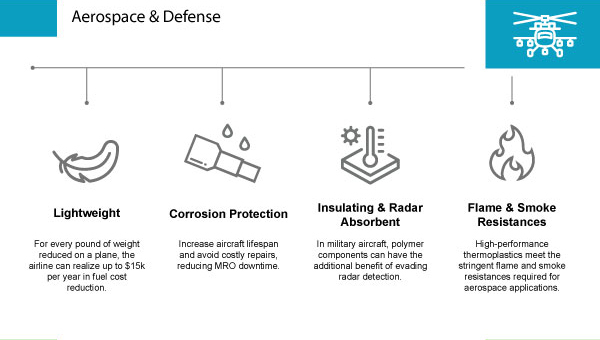 The recent popularity of PEEK (polyetheretherketone) in complex industries such as Aerospace & Defense and Medical & Life Sciences is well documented, and for good reason: this lightweight thermoplastic bears properties that make it ideal for a variety of specialized applications. This versatility makes PEEK equally capable of being used for implants and custom medical devices or machined lightweight aircraft components. What is less known, however, is the process that goes into machining this plastic material. 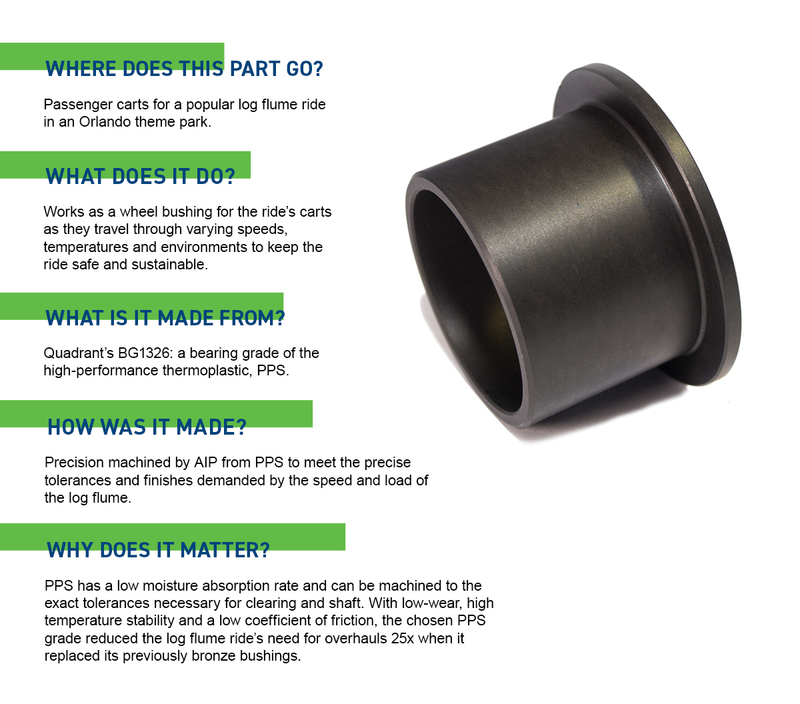 With over 35 years of experience machining this thermoplastic material, we at AIP have written a brief introduction to machining PEEK. We hope this gives you some insight into our polymer machining process, and how it differs from that of metal machining or injection molding. Before discussing the process of machining PEEK, it’s important to understand exactly what plastic machining is. CNC (Computer Numerical Control) machining is a process in the manufacturing sector that involves the use of computers to control machine tools. In the case of plastic machining, this involves the precise removal of layers from a plastic material. The technique of utilizing drilling tools to carve plastics was introduced by MIT during the 1950s, and because this process is computer-controlled, products with extremely precise tolerances can be achieved. Due to the many different kinds of polymers and composites, it’s important to have strong technical expertise of polymer materials when machining plastic components; some plastics are brittle, for example, while others cut similarly to metal. The challenge of plastics is their wide range of mechanical properties and varying behavior when machined. Therefore, it’s important to understand the polymer structure of PEEK if you’re machining it. 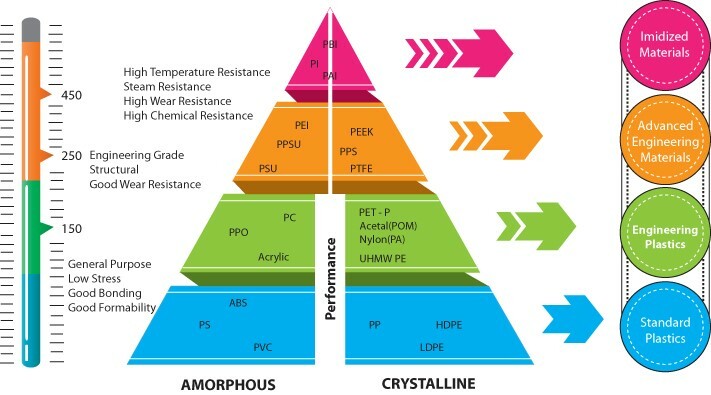 When it comes to polymers, you have two basic types: thermoplastics and thermosets. It’s crucial to know which one you’re working with due to distinct differences between how those polymers react to heat and temperature. Phenolic materials would be considered examples of a thermoset, while PEEK is an example of a thermoplastic. 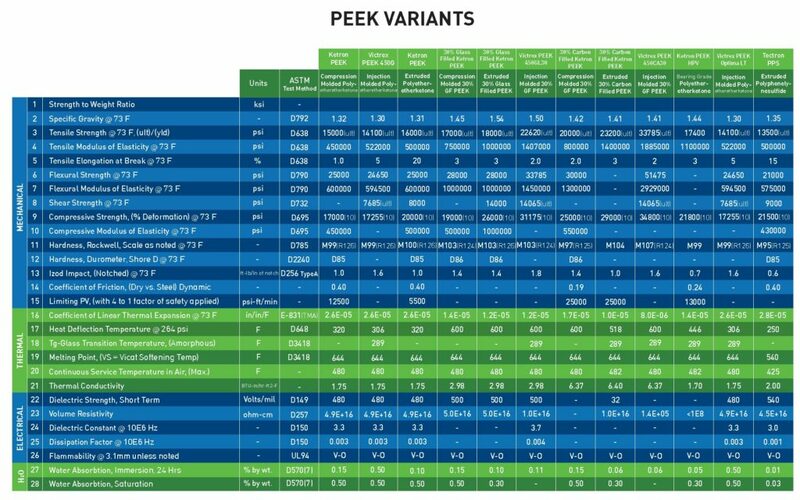 In particular, PEEK is considered a semi-crystalline, high-performance thermoplastic. This gives it enough elasticity to be machined to various custom designs, with strong mechanical properties that provide resistance to fatigue and stress-cracking, as well as a good structure for bearing, wear, and structural applications. Depending on your application, you’ll want to machine either industrial-grade PEEK or medical-grade PEEK. Industrial-grade PEEK is a strong, flame-retardant and abrasion resistant thermoplastic with high impact strength and a low coefficient of friction. It’s known for retaining its mechanical properties, even at elevated temperatures. As suggested by its name, this grade is most commonly used in aerospace, automotive, chemical, electronics, petroleum, as well as food and beverage industries. Medical-grade PEEK adds biocompatibility per ISO 10993, high chemical resistance, and sterilization compatibilities to the above list of qualities. In addition, this thermoplastic is radiolucent, meaning it is not visible under X-ray, MRI or CT. Medical-grade PEEK includes polymers suitable for implants, such as PEEK Optima and Zeniva PEEK, which can stay in contact with blood or tissue indefinitely while mimicking the stiffness of bone. 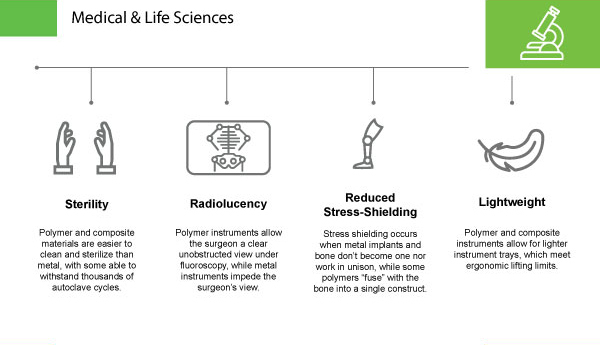 Other variations of medical-grade PEEK can be used for custom medical components and applications, such as articulating joints and spinal devices. Most shops receive PEEK in the form of rods of various lengths, ranging from 6mm to 150mm in diameter. Stress-relieving before machining through an annealing process is crucial, as it reduces the likelihood that surface cracks and internal stresses will occur from the heat generated. Additional benefits of annealing include increased levels of crystallinity and the opportunity to limit dimensional changes. If your PEEK components will undergo long stretches of machining time, it is likely you will require additional intermediate annealing steps to assure the ability to maintain critically tight tolerances and flatness. Both industrial-grade and most medical-grade PEEK machine similarly, save for PEEK reinforced with carbon fiber. Silicon carbide cutting tools work well for natural PEEK, while diamond tools work well for PEEK reinforced with carbon-fiber. 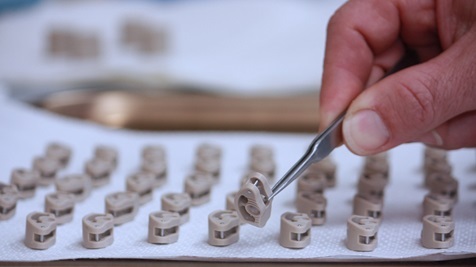 For medical-grade PEEK applications, the best way to avoid jeopardizing the biocompatibility of the material is to machine dry. However, PEEK doesn’t dissipate heat the way that metals do, so often a coolant is necessary. In that case, air is the coolant option least likely to affect medical-grade PEEK’s biocompatibility. Any chips that are a result of machining medical-grade PEEK can be reused for industrial applications. Contamination is a serious concern when machining polymer components for technically demanding industries such as aerospace and medical. To ensure the highest level of sanitation down to the sub-molecular level, AIP Precision Machining designs, heat-treats, and machines only plastics, with any sub-manufactured metalwork processed outside our facility.